Rural communities and social organizations in El Salvador agree that the lack of specific laws is one of the main hurdles to resolving disputes over water in the country. “If the right to water was regulated in the constitution, we wouldn’t be caught up in this conflict,” said David Díaz, a representative of the Asociación de Desarrollo Comunal Bendición de Dios (Adescobd). (IPS) – Rural communities and social organizations in El Salvador agree that the lack of specific laws is one of the main hurdles to resolving disputes over water in the country. “If the right to water was regulated in the constitution, we wouldn’t be caught up in this conflict,” David Díaz, a representative of the Asociación de Desarrollo Comunal Bendición de Dios (Adescobd), which administered a rural water supply system, told IPS. He lamented what he called one of the biggest setbacks regarding water supplies in this Central American nation. On Oct. 30, right-wing lawmakers blocked the single-chamber legislature from ratifying a previously approved reform to article 69 of the constitution, which granted the right to water and food the status of a human right, thus forcing the state to guarantee universal access. Adescobd emerged in late 1995 in Tacuba, a town in the western department (province) of Ahuachapán, 116 km west of San Salvador, to manage a project for a piped water system that would supply seven villages. Since 2007 the association has been caught up in a bitter dispute with the mayor of Tacuba, Joel Ernesto Ramírez, over control of the system. “The project is ours, we have been working hard, our husbands have gone hungry working to set up the system….it’s not the mayor’s project,” Ermelinda Hernández, a resident of the village of La Puerta, told IPS while washing cooked corn before making tortillas for lunch. The members of the association built the water supply system after the mayor’s office denied them support and they obtained funds from the United States Agency for International Development (USAID) and technical assistance from Creative Associates International. But local residents of the seven villages, which are home to a combined total of 12,000 people, said the mayor had taken over the project. They complain that the mayor, arguing that former administrators – who have since been removed by the association – drove it into bankruptcy, is attempting to gain possession of the farm where the water that supplies the system emerges, and thus control the water supply. They also allege that Ramírez plans to sell water to other communities outside the municipality and not involved in the project, which would leave the seven villages short of water. IPS was unable to contact the mayor, to hear his version of events. With the constitutional reform, “we would have had the best legal tool to defend ourselves, the constitution would have given us the support we needed,” said Díaz, who is from the village of Loma Larga. But the legislators of the right-wing National Conciliation Party (PCN) and Nationalist Republican Alliance (ARENA) refused to ratify the constitutional reform. The amendment was approved in April 2012 by 81 of 84 lawmakers, right at the end of the three-year legislative period. In this Central American country of 6.2 million, constitutional reforms must be approved during one legislative period and ratified with two-thirds of the vote (56) in the following – in this case, during the period that ends in May 2015. 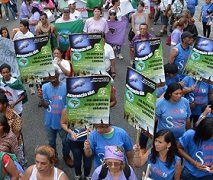 The aim of the constitutional amendment was to make sure that the state gave top priority to the use of water by the population rather than to economic interests, activist Karen Ramírez, a spokesperson for the Water Forum, which groups more than 100 organizations fighting for the right to water, told IPS. The reform established that it was the obligation of the state to use and preserve water resources and ensure access for the population. That commitment required public policies and laws to regulate the sector. Piped water in El Salvador is supplied by the Administración Nacional de Acueductos y Alcantarillados, an autonomous state company without the authority to decide who has a right to water, in case of conflicts or shortages. Neither does it have jurisdiction over community projects like the one in Tacuba, nor a voice in the present conflict. Currently, the residents of the villages involved in Adescobd have unlimited water supplies, even though in May 2014 the Supreme Court threw out a legal injunction against the closure of the association by the mayor. Adescobd is preparing to file a complaint against the violation of its rights with the Inter-American Human Rights Commission (IACHR), the association’s lawyer, Edwin Trejo, explained to IPS. Visiting the affected communities, IPS talked in Los Pinos with men, women and children who were lined up on a plot of land next to a dirt trail, waiting to fill up their jug at a community tap connected to the system, which provides water free of charge. “We used to have to walk two hours to the Nejapa river to fill up our jugs; now we can get water right here,” said one of the women, María Esther Gómez, indignant like the rest over what they see as maneuvering aimed at taking their water. The dispute in Tacuba is just one example of the conflicts over water in El Salvador, because of the lack of laws, regulations and oversight. Another case is the conflict in El Tablón, in the municipality of Sociedad in the eastern department of Morazán. The local inhabitants of the villages of Los Amayas, El Carrizal and El Centro are fighting with the people of a fourth village, Las Cruces, for control over the water. The system of piped water was built by the four villages in the 1980s. “They think we’ll leave them without water, but that’s not true; what we want is for it to be distributed in equal parts; we don’t want them to take advantage,” Aura Zapata, a small farmer, told IPS, referring to the situation with the people of Las Cruces. In El Salvador, 93.5 percent of the urban population has access to piped water, compared to 69.8 percent in rural areas, where 15 percent are supplied by wells and another 15 percent by other means, according to the Multiple Household Survey, carried out in May 2013. The Water Forum’s Ramírez said the legislators opposed to the constitutional amendment wanted to protect the interests of powerful business groups, who believe their revenues would be threatened if the constitution were to put a priority on access to water for the population. The failure to ratify the constitutional amendment came on top of another setback for the advocates of the democratization of access to water. After years of delays, the legislature is finally debating a general law on water. But in the committee in charge of the bill, right-wing lawmakers modified the key article of the text, art. 10, which created a new regulatory agency, the National Water Commission (Conagua), under the Environment Ministry. On Oct. 7, legislators from the PCN, ARENA and the Great National Alliance (GANA) introduced a change, according to which Conagua would be controlled by a new autonomous body, with the participation of five business chambers and two state agencies. “When there are conflicts where the regulatory agency must decide in favour of the people, the vote there would put the rights of the poor at a disadvantage,” Ramírez said. The governing left-wing Farabundo Marti National Liberation Front (FMLN) and the Environment Ministry say they will revoke that modification during the legislature’re plenary debate of the bill. The FMLN is the strongest force in parliament, but it only has 31 deputies, compared to ARENA’s 28.